Rampage. 2009. Directed & Written by Uwe Boll. Starring Brendan Fletcher, Shaun Sipos, Michael Paré, Matt Frewer, Lynda Boyd, Robert Clarke, Malcolm Stewart, Steffen Mennekes, and Katharine Isabelle. Event Film Distribution. So I’ve been dying to review a couple of the Uwe Boll films that I find are actually decent. As I mentioned in my review of the intense and wild Stoic, I don’t think Boll deserves all the hate he gets online and otherwise. I know that many people see him as an arrogant, egocentric fool, but I don’t see him that way. Sure, he takes the haters by the horns, especially lately with his mad rant online after his funding campaign for a new Rampage instalment failed. I just don’t see why people have pushed him to that point. I agree not many of his movies are good. However, I think filmmakers, and artists in general, ought to be given a chance to get better. Is it easy to make movies? No, it’s not, though fans seem to think it is by the way they treat directors and actors who make subpar movies. With Rampage, I believe Boll has crafted a damn good action thriller that’s a lot more interesting than so many other movies in that category as of late. There’s a good deal of crazy action, yet what interests me most about the film is the premise Boll has come up with for the main character and what he eventually begins to do as the film goes on. Rampage is the story of Bill Williamson (Brendan Fletcher). Ole Billy, by all accounts, is what I would call a real slacker. He’s living at home with his parents (played by the fantastic pairing of Lynda Boyd and Matt Frewer), whom he gives a hard time, as if they’re meant to usher him from a boy to a man. Bill works at a garage where he’s not treated how he would like to be treated. Outside of home and work, he beats around with his equally slack buddy Evan Drince (Shaun Sipos who did an excellent job in Boll’s other fairly solid 2009 movie Stoic). 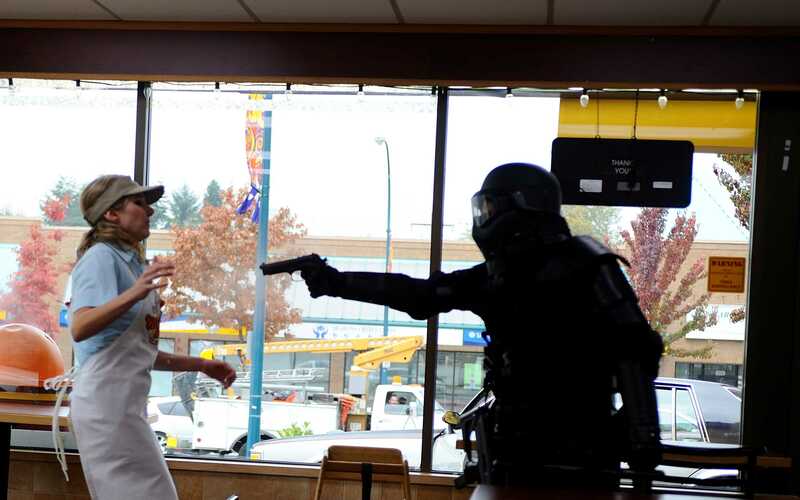 The two of them eat chicken and play paintball together. Lurking underneath all the normality, Bill is a troubled man. Inside him brews a combination of childishness and being unprepared for life, crossed with the injustices of society both actual and perceived. This develops into a boiling rage. 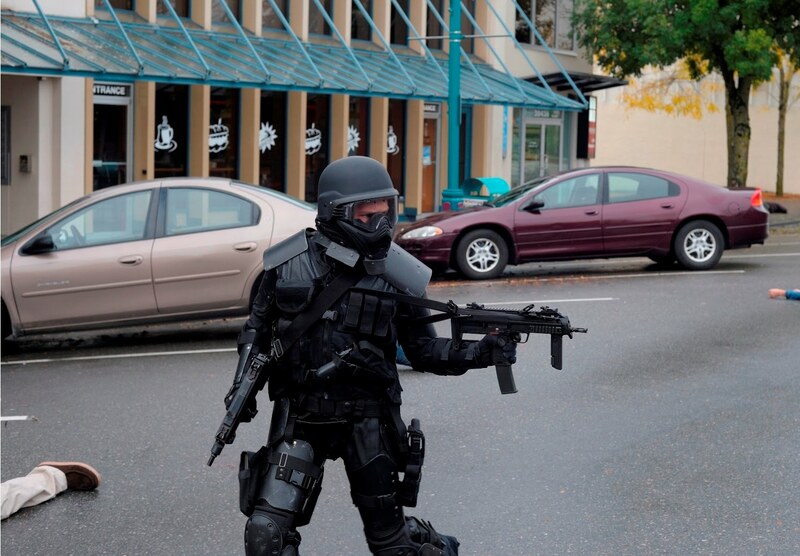 Bill pieces himself together a full bodysuit of armour made of Kevlar, as well as the guns and ammo and toys to boot, then heads out onto the streets: the rampage is on and no one is safe. Least of all the structures of society, which Bill – misguided or not – takes aim towards, blasting hard as he can. There are definitely a few faults in the movie’s own logic. Perhaps this has more to do with the fact the script for Rampage was officially only about 10 or so pages long and less with any lapse in reason. Maybe the fact so much improvisation went into the filming made some of the plot get muddled. Either way, there’s not enough plotholes or anything in this movie for me to be turned off. Boll does a pretty good job with the material he brainstormed going in. What I do enjoy quite a bit is the character of Bill. Not in the sense I agree with the verbal manifesto Bill Williamson pours on us through the camera’s eye throughout Rampage. I think, in my opinion, Bill is ultimately representative of dangerous right-wing logic. Others will say he represents something different, but I think the juxtaposition between Bill Williamson and Evan Drince at so many points speaks volumes. You can tell how Bill is so completely driven by the media, by right-wing flawed logic, and so on, as the television clips & radio stations flick by in the background, like they’re lodged in his brain. You can tell so perfectly what Bill is setting up as he switches the bag of fake money in for the one with the real stuff, then burns the fake money declaring it is the worst problem of the world. You see how he’s not any kind of left-wing extreme activist. He’s the sort of person who we might see in any school or military complex or theatre, as is so often seen in America today – a sad, lonely, pessimistic soul who only wants to drag the world down to their level. My opinion is that Uwe Boll is making more of a statement about the people who commit these vicious rampages, armed to the teeth, than anything else. While maybe some of the opinions spouted off by Evan are more relatable, Bill Williamson represents the antisocial man in society, the one who just wants to watch the world burn, if I might steal a better written line than I’ll ever write. Even though Bill is an awful person for his crimes, the character is still interesting and I think Bol does well with making statements about this sort of madness. Honestly, he needs to move further away from video game adaptations more and more. If he can do more stuff like Stoic and Rampage, I’d gladly support him even more than I already do. Not sure what the budget on this film is, but I’ve got to admit some of the action is great work. As Bill stalks the streets of his city, first disabling the police station with a van loaded up on bombs in its trunk, he starts to mow down anyone and everyone in his path. There are points where I was more than impressed with the raw action Boll was giving us. One scene Bill gets hit with a couple shots from the police, but his Kevlar bounces the shots off him and then he responds with his own gunfire, ripping the cops apart. Vicious, savage action. Got to love some of that! While disturbing, it’s actually a little funny – of course in a pitch-black sort of way – to see Bill confront a barista in the coffeehouse where he’d earlier been snubbed and insulted by the same man. It’s tense and terrible in the end, however, a brilliant little scene to watch. There’s a bunch of dark comedy mixed in. Though, most of the film is highly serious. Pretty grim, yet exciting all the same. What I like most of all, though, is Brendan Fletcher. The first time I can remember seeing him was way back now, about 15 years ago. I was watching Showcase and a film called Rollercoaster came on; he blew me away with his performance. After that, I made sure to catch any film or television show I could find him in. He has this incredible capacity for emotion, as well as a knack for dark roles. Here he displays several bits and pieces of those qualities. The mocking way he treats people, walking around town and blasting the citizens to bloody chunks, it’s truly macabre to see. Coupled with the action, its intensity, I think Fletcher’s work as the lead actor helps Boll make a solid thriller out of the material. Not sure how much of the character of Bill Williamson came from Fletcher, and what came from Boll. Regardless, I get the feeling the work well together and I’d like to see something outside of the Rampage movies where they work together. I know Fletcher has been in other Boll stuff, but I’d like a new film; maybe similar tone to this stuff, just a different story altogether. They appear to have similar sensibilities at times. I can’t not give this 4 out of 5 stars because I really do enjoy the film. Sure, there are moments I bet having a script, as I mentioned before with Stoic, might have been a benefit in the end. Although, I believe having an actor as solid as Brendan Fletcher playing the central role is something which ultimately helps the fact much of the “script” comes from improvisation. I’d like to hear the commentary on this film some day, perhaps more would be explained on that side of things. The best part of it all is what I perceive to be Boll’s take on those who view right-wing extremist policies as the appropriate way to go, and what all these Kevlar, assault rifle toting gun lovers seem to be thinking in their heads. Bill Williamson is in no way a character fighting for the rights of every citizen, he’s fighting both society and the citizens in it. He just wants to tear it all down. 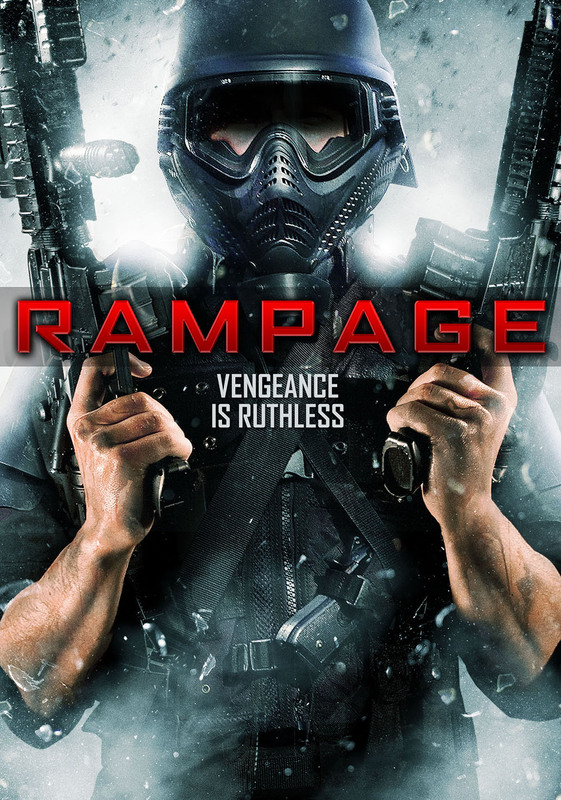 Either way, if you’re looking for something a little different and you’re secretly rooting for Uwe Boll, with every one of his films, to finally come out with something decent, you ought to check out Rampage. You might be pleasantly surprised with the end results.